This small-group tour limited to just 14 guests will have you feeling like a Torontonian for a day as we guide you around the Canada's most multicultural and diverse city. Visit Toronto's most popular sights, its local hotspots, and discover the city's many hidden gems in our modern, fully air-conditioned vehicles. So get ready for a small group tour that is fun, authentic and memorable. We start the tour at Harbourfront, going past Toronto's bustling waterfront and pointing out Rogers Centre and the CN Tower on the way, as well as the Toronto Islands from the Yonge Street/Queen's Quay vantage point. We stop at Sugar Beach, Toronto's urban beach park before exploring the Distillery District, where we walk around the restored historic buildings. Then we go to St. Lawrence Market, one of the world's top food markets. We do a walk through the market and then we head to the Flatiron Building, one of Toronto's most photographed landmarks. On Yonge Street, we pass the Eaton Centre and then stop at City Hall for a picture at the new TORONTO sign which has quickly become a landmark. After City Hall, we proceed on Queen Street pointing out Osgoode Hall and the Four Seasons Centre before heading to Queen's Park, home of Ontario's government. We then proceed along the campus of the University of Toronto, pointing out the Bata Shoe Museum and the old home of Mr. Gooderham. We then pass Varsity Stadium, Koerner Hall and the Royal Conservatory of Music, plus the Royal Ontario Museum as we cross over to trendy Yorkville. 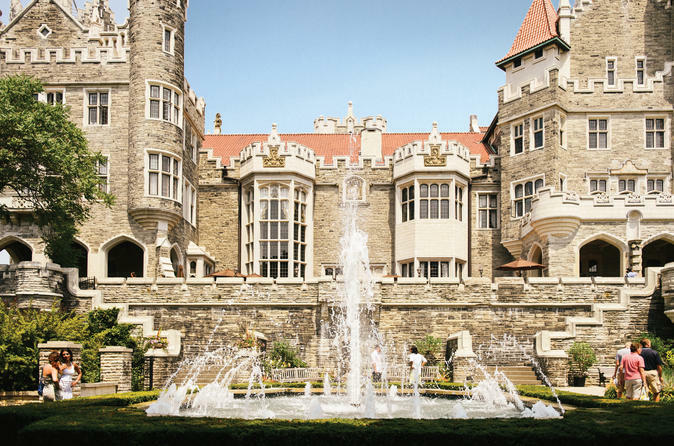 We venture up to Casa Loma for a stop at this historic castle. From there, we explore Chinatown and the Kensington Market. Complimentary pickup and drop off are included anywhere in downtown Toronto. Every vehicle has one driver and one guide, so the driver can focus on driving and the guide can focus on making the day exceptional. Remember to bring your camera as we make lots of photo stops! Please note: the itinerary is subject to change without notice due to traffic conditions or time constraints. Admissions is included to Casa Loma. Tour starts once all guests have been picked up.